Mosconi Cup First Day: Europe Sweeps America! The Mosconi Cup matches held in London today had a surprising outcome: Europe, which suffered a crushing 12-1 defeat last year, has leapt to a 3-0 lead on the first day of this year’s competition. In the first matchup, Team Europe team captain Oliver Ortmann and fellow German Ralf Souquet took on American team captain Johnny Archer and veteran pro Nick Varner. Team Europe took first blood with a 5-2 victory. In the second match of the opening session, Scandinavians Mika Immonen and Marcus Chamat faced American young guns Cory Deuel and Charlie Williams. Immonen won the lag and ran out to take a 1-0 lead, and that set the tone for the match. Europe picked up another point with a 5-1 victory. In the final matchup of the evening, American spirits were flagging, and the European support was growing stronger by the minute as home-team favorite Steve Davis and fresh-faced rookie Nick van den Berg faced Americans Earl Strickland and Jeremy Jones. This match was closer, 5-4, but with the same outcome: Europe took another point. The Mosconi Cup will head into its second day with Europe holding an unprecedented shutout advantage. 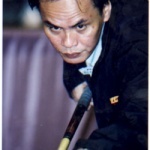 Check our live-coverage link at the top of the page for on-site coverage, or visit www.mosconicup.com. Bustamante zeroed in on the title in Vegas. Bustamante won $7,000 for first place, Souquet took $3,800 home. 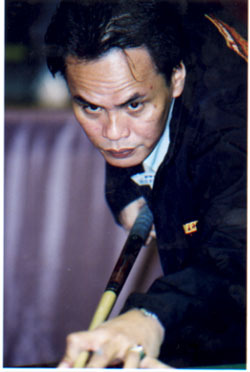 While some of the top names (such as Johnny Archer and Earl Strickland) were absent from the 37-man, one woman field, a full complement of Filipino players and such heavy hitters as Rodney Morris, Cory Deuel, Kim Davenport and the tournament promoter himself, Allen Hopkins provided entertaining action for the hard-core pool fans and handfuls of American Poolplayers Association members who were there for their national team championships running concurrently next door. The final wasn’t the break-fest that everyone had expected, but Strickland’s come-from-behind, 17-15 win over Bustamante will be remembered as one of the epic heavyweight battles in 9-ball. When the last ball dropped, following the nerve-wracking, seesaw set, Strickland leapt onto the table in triumph. “It’s a complete honor to win this title,” he later declared. For in-depth live coverage, click on the World Championship link above.